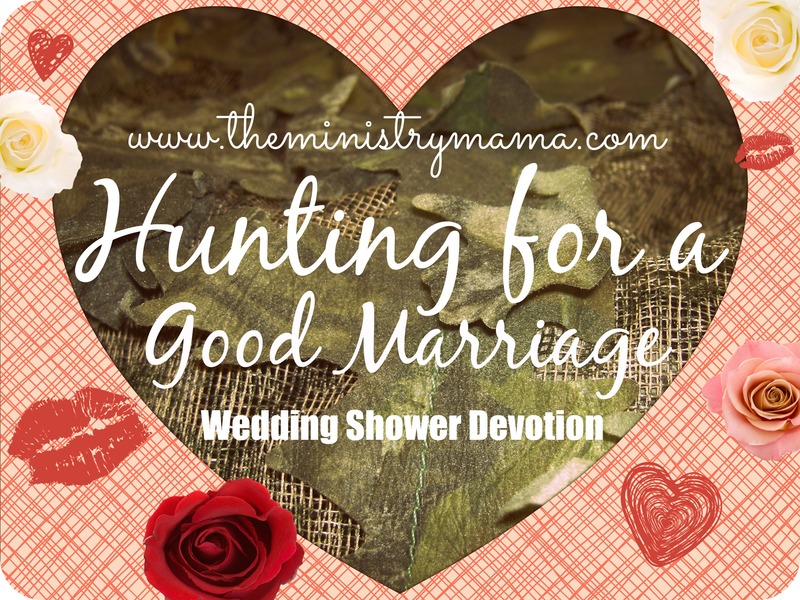 This was written for a ministry friend that is planning on hosting a hunting themed wedding shower for a young lady in her church who shares the love of hunting with her future husband. I love the idea of incorporating the bride’s interests into the shower with pink and camouflage decorations. Hunting is its own hobby and sport. It takes a large amount of self-discipline as well as training in how to go through with killing the animal you’re hunting. Let’s think of just a few things that are required when you go hunting. Your hunting gear (clothes) – This is very important to keep yourself hidden and warm while you wait for your opportunity to make a shot. The wife’s proper clothing is found in I Peter 3:4,5 “But let it be the hidden man of the heart, in that which is not corruptible, even the ornament of a meek and quiet spirit, which is in the sight of God of great price. For after this manner in the old time the holy women also, who trusted in God, adorned themselves, being in subjection unto their own husbands:” This is not a popular set of clothing to wear because as these verses say, it comes at a great price. The cost is our words and how hard it is sometimes to put on a meek and quiet spirit! But when we do, it shows we trust God to take care of things in our marriage. The right weapon – As a good clean gun is important to a hunter’s outing, the weapon of a good wife will be the same weapon as a good Christian, which is the Sword of the Lord, the Bible. The Word of God will help you defeat the enemy as he attempts to attack you as you seek to honor God with your marriage. The Sword will also teach you how to correct your own heart and ways (Hebrews 4:12). The right sight – Not only is a good gun the most important piece on a hunting adventure, but you should have a good sight on your gun so that you can look through it and see the animal that you are planning on killing. There are other sights you should keep your eye on as you walk through marriage together with your husband. Keep you sights on: The Lord, your husband, and your family. God and His Word will help you to be the best wife and hunter that He wants you to be. He is the best at watching out for us and helping us in our marriage. I pray and hope that the Lord will be always in your sight that you can walk with your husband for as many years as the Lord will allow you together. Click on Hunting for a Good Marriage printable pdf. version. Please remember that this is to be used for church or personal use only. I love this because I am a fan of maximizing opportunities that both wedding and baby showers give to share the gospel. Great idea and template for others to use at their showers. Thank you Gina! I think you’re right, wedding and baby showers are a definite opportunity to teach and encourage people to live for the Lord.